The nation’s top FCS recruiting class will get its first taste of the road against 123rd-ranked FBS scoring offense (19.3 ppg) from a year ago. The Governors, meanwhile, look to build on a 2016 campaign that saw them amass 4,000 yards total offense for the second time in school history. In just his third appearance last season, JaVaughn Craig set a school record with 466 yards total offense against Tennessee State, while Kentel Williams followed that up a week later with an Ohio Valley Conference-record 399 all-purpose yards. Both will be sophomores in 2017, along with such precocious talents as Kadeem Goulbourne, Jaison Williams, Chris Hopkins and Prince Momodu, who received a scholarship in a surprise ceremony Sunday. Tabbed to finish fourth in the American Athletic Conference’s East Division, Cincinnati is led by first-year head coach Luke Fickell, the longtime Ohio State defensive coordinator. The Bearcats were 4-8 last season—their first losing record since 2010—but were 3-4 at Nippert Stadium. 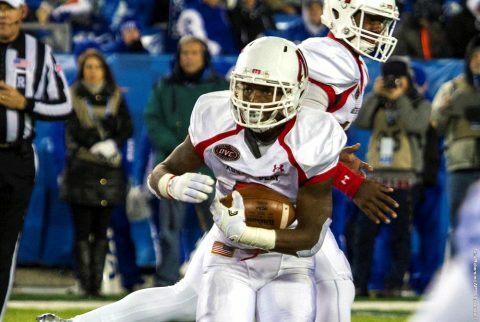 Austin Peay looks for its first victory in six tries against the FBS Bearcats; the two teams last met September 3rd, 2011, in a 72-10 defeat. A year ago, the Governors offense reached new heights in its first season under Healy and offensive coordinator Wesley Satterfield. Under their guidance, the program amassed 4,042 yards total offense – second-most in program history –Williams earned OVC All-Newcomer honors. Gunnar Scholato didn’t just become the first Governor since 2008 to post a 100-tackle season a year ago; he blew past the mark with 124 total stops, most by a Governor since 2000 (Drew Wilson) and the seventh-most in FCS last season. He tied for the OVC lead with 11.2 tackles per game, earning second-team All-OVC honors in the process. He picked off a pass and returned it for a score in the season finale at Kentucky, bookending a fantastic campaign that began with him earning a scholarship after the 2016 Red-and-White Game. This is the second season in a row, and sixth time since 2011, the Govs will open the regular season against an FBS opponent; Cincinnati also was the 2011 campaign’s first foe. As a team, the Govs rushed for more than 200 yards in four straight games to close the 2016 season, topping out with 322 yards on the ground against Tennessee State (Nov. 5). Not only was that Austin Peay’s first 300-yard rushing game since Nov. 16, 2013 against Southeast Missouri, it’s the first streak of four or more contests with 200 or more yards on the ground since Austin Peay began keeping game-by-game records electronically in 2002. Williams touched off a piece of OVC history with his league-record 399 all-purpose yards against Eastern Kentucky (Nov. 12). He became the first player in league history to earn OVC Newcomer, Offensive Player and Specialist of the Week in the same week, as well as APSU’s first STATS FCS Freshman of the Week honor. By himself, Scholato had six double-digit tackle outings in 2016. The entire Austin Peay defense had five such individual performances in 2015. The last Governor with four or more single-game double-digit tackle efforts prior to Scholato was Antwaun Majors in 2011. Be sure to follow all the Austin Peay football action at LetsGoPeay.com and the official Facebook page of Austin Peay Athletics. In addition, live play-by-play coverage can be found on Twitter (@AustinPeayFB) and PeayStats.com. Live coverage from this weekend will be provided via streaming (ESPN3).